Parents in Scotland think their bundles of joy are just Awesome and Adora-Belle. Those are just two of the latest names registered at the National Records of Scotland last year. Also recorded were two Divines and a Wiseman. Girls' names also included Pearl, Diamond, Rubi, Crystal and Sapphire. Olivia and Jack remain the most popular baby names with Smith, Brown and Wilson the three top surnames. The NRS list, published on Tuesday, is the complete list of forenames given to babies whose births were registered in 2018. No-one has been brave enough to call their baby Brexit, but four girls share a forename with First Minister Nicola Sturgeon. However, only one infant last year was given the same first name as Prime Minister Theresa May. 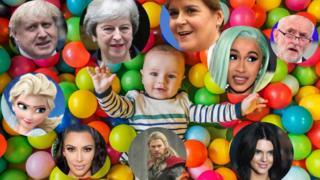 The list of the year's names did get political, with a baby boy called Corbyn, as well as a Corbyn Blue, and one who was called Boris. No-one was named after Trump, but there were six Donalds. There were also 10 Reagans, two Clintons and 113 Carters. The celebrity influence continues, with singers inspiring girls' names. Amongst the top 100 were various spellings of Ariana, a Cardi, and even a Cher. Interestingly, there were no Kylies, only one Kimberly, but three Kourtneys, five Kendals and 16 Khloes. Also flying onto the list were Robin, Wren and Birdie, with 28 Autumns, 60 Summers, 12 Winters and 10 Wynters. Other children were given the same names as various places around the globe, including some who share a name with some of Scotland's more remote islands. There were 11 girls born last year called Islay, one called Tiree and one girl called Harris - although there were 294 baby boys given this as a name. Also on the map were the names Rome, Paisley and Stirling. Other unusual names chosen for girls included Zuzu, Snow, Sno, Destiny-Dior, Rebel and Royalty, while there were boys given the names Prince, Keanu, Atlas, Thor, Odin and Fox. From Kayleigh to Khaleesi: What are we named after?